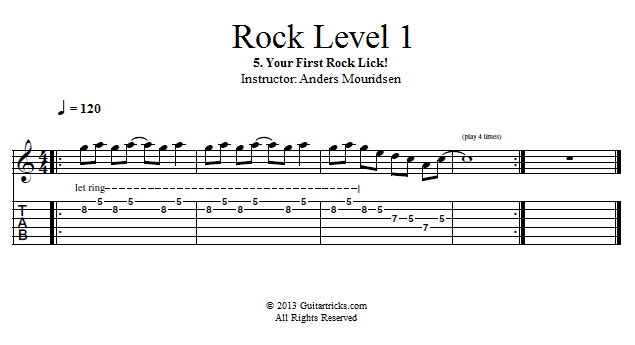 Guitar Lessons: Your First Rock Lick! So far we've looked at a bunch of notes and we have had some fun jumbling them up and being creative with them. Now it's time start learning what are called "licks", which is just an example of something cool you can play with these notes. Imagine you're learning a foreign language. The notes are words, and the "licks" are examples of sentences you can form using these words. In this lesson I'll show you a basic rock lick that uses the notes of the minor pentatonic scale.